Falck Medical, INC, an FDA registered corporation, is a leading developer of innovative technologies with applications in the diagnosis and treatment of ischemic retinopathies, age related retinopathies and glaucoma. All of the technologies are covered by multiple national/international patents and patent pending applications. To learn more about these innovative technologies please contact us. Slit Lamp Mounted, Cleared by the FDA for Tonometry, Ocular Pulse Amplitude, Tonography, and Ophthalmodynamometry Measurement. No statistical relationship found between FAT1 readings and corneal curvature or thickness, r2 < 0.05. Average Coefficient of Variation: 2.6% +/- 0.10 (5 to 50mmHg). Average Standard Deviation: 0.7 mmHg +/- 0.4 (5 to 50mmHg). The mean conventional outflow facility (C) difference between the FAT1 and the reference Indentation Tonographer over a range of 0.01 to 0.70 ul/min/mmHg was 0.0043 ul/min/mmHg ( 95% CI, 0.001 to 0.0076 ), n= 182. Average FAT1 conventional outflow facility measurement in the glaucoma group was 0.09 +/- 0.05 and in the non-glaucoma group was 0.31 +/- 0.12 ul/min/mmHg, p < 0.0001, n = 182. Average FAT1 IOP measurement in the glaucoma group was 20.02 +/- 5.5 and in the non-glaucoma group was 18.6 +/- 2.4, p = 0.01, n = 182. 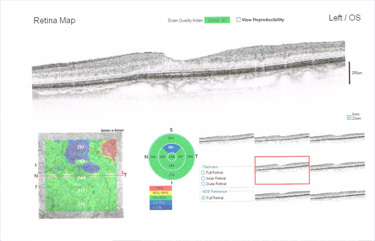 In the High outflow facility group (C > 0.18) (non-glaucoma, 28/30 eyes) 93.3% of the paired differences were within +/- 1.96 standard deviations of the mean difference between the FAT1 and the reference Indentation Tonographer, n=60. In the Medium outflow facility group (C >0.09 < 0.18) (glaucoma, 29/31 eyes) 95.2% of the paired differences were within +/- 1.96 standard deviations of the mean difference, n=62. In the Low outflow facility group (C < 0.09) (glaucoma, 30/30 eyes) 96.7% of the paired differences were within +/- 1.96 standard deviations of the mean difference, n=60. For every 10 mmHg change in IOP average anterior chamber fluid volume change was 3.22 ul/minute, for a 20 mmHg change in IOP average anterior fluid volume change was 7.027 ul/minute and for 30 mmHg change in IOP average anterior fluid volume change was 11.75 ul/minute, r2 = 0.99. The correlation coefficient for volume decrease and corneal indentation was 0.999. The correlation coefficient for volume decrease and applanation diameter was 0.997. The average OPH estimated Central Retinal Artery Force was 59.73 +/- 11.10 mmHg. The Mean Brachial Artery Blood Pressure (MBAP) was 93.16 +/- 8.32 mmHg. The average IOP was 15.72 +/- 3.04 mmHg. The average calculated Ocular Perfusion Pressure was 44.01 mmHg. 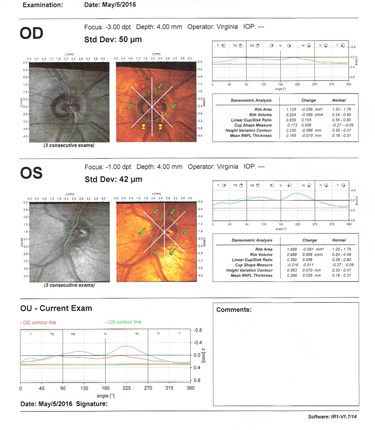 New Multifunction Applanation Device Which Can Be Used as a Risk Assessment Tool in the Management of Glaucoma and Vascular Disorders Published in CFOCEO Magazine on 03/21/2016. Click on this link to read full text of the interview. An 82 year old male presented with a history of Branch Retinal Vein Occlusion in the supero-temporal quadrant of his left eye. On examination arteriolar narrowing and arterio-venous compression was noted. The OCT image demonstrates thinning and loss of normal architecture in the supero-temporal quadrant. Mean Central Retinal Artery Pressure (MCRAP) and Ocular Perfusion Pressure (OPP) were measured using the Ophthalmodynamometry Function of the FAT1 Device. With normal vascular physiology and normal vessels, in the upright position MCRAP should be equal to or greater than 60 % of ipsi-lateral Mean Arterial Brachial Blood Pressure (MABBP). Ocular Perfusion Pressure (OPP) is the difference between MCRAP and IOP. Ocular Perfusion Pressure is the net force that drives blood flow into the eye (Adlers Physiology of the Eye, Clinical Application, Tenth Edition, Chapter 33, Ocular Circulation, page 764-765). The measured ipsi-lateral MABBP was 106 mmHg, 60% of this value is 60.6 mmHg. The FAT1 measured MCRAP was 52.8 mmHg which is less than expected and the OPP was 36.2 mmHg which is also less than expected. 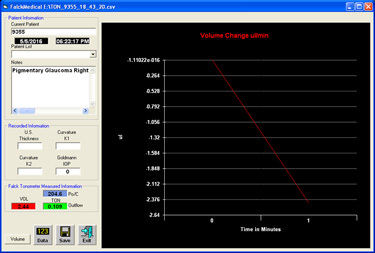 See FAT1 Ophthalmodynamometry Result Screen. In the FAT1 Ophthalmodynamometry study, in healthy eyes the Average Ocular Perfusion Pressure was 44.01 mmHg. Both values are less than expected, documenting decreased retinal perfusion from the BRVO and atherosclerosis. An 80 year old male presented with an episode of temporary vision loss in his right eye one week ago. No plaque or other emboli were found on examination. Using the Ophthalmodynamometry Function of the FAT1 Device, Mean Central Retinal Artery Pressure (MCRAP) and Ocular Perfusion Pressure (OPP) were measured. Measured Mean Ipsilateral Arterial Brachial Blood Pressure (MABBP) was 89.3 mmHg. Sixty percent of this value is 53.6 mmHg. Measured Mean Central Retinal Artery Pressure (MCRAP) was less than expected at 44.9 mmHg. Ocular Perfusion Pressure (OPP) was also less than expected at 32.1 mmHg. 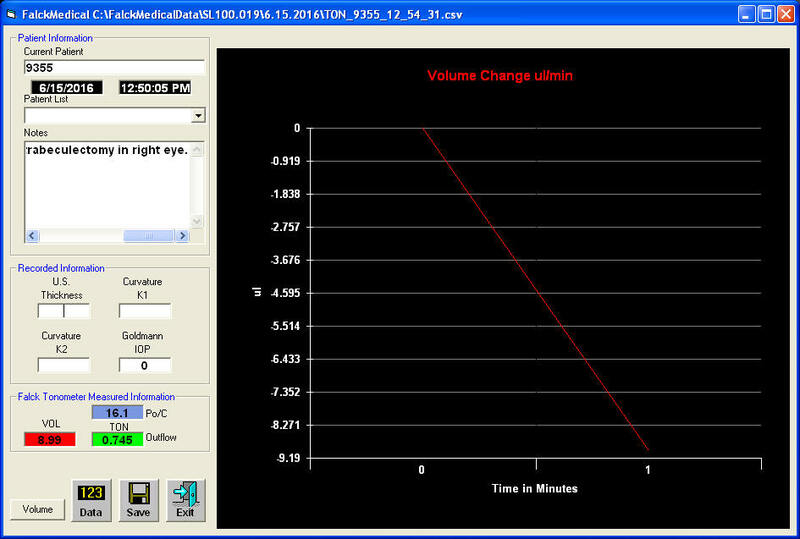 See the FAT1 Ophthalmodynamometry Result Screen. Because the history and the FAT1 results were suggestive of carotid vascular disease, an intracranial Magnetic Resonance Imaging Arteriogram was performed which confirmed atherosclerotic carotid vascular disease and raised the possibility of an anterior communicating artery aneurysm. See the MRA report. A CTA was scheduled for further evaluation. 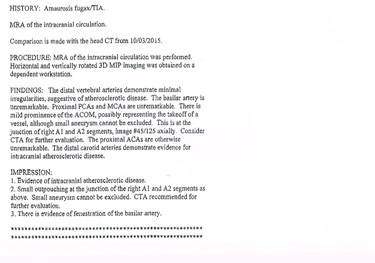 The CTA confirmed an anterior communicating artery aneurysm. An 57 year old male with Pigmentary Glaucoma in the right eye presented with elevated Intraocular Pressure (IOP). Current medications were Combigan BID, Pilocarpine 1% TID, Travatan QHS and Diamox 500 mg BID. On gonioscopy the angle was open with 4+ pigment. Laser Trabeculoplasty was performed. The IOP remained elevated at 30 mmHg well above the target value. Heidelberg Retinal Tomography documented progressive thinning of the nerve fiber layer at 6 and 12 o’clock. See the HRT results. The Tonography Function of the FAT1 Device was used to assess Trabecular Meshwork Aqueous Humor Outflow. Aqueous Humor Outflow was reduced at 0.109 microliters / minute and the ratio of the IOP (Po) to Outflow (C), Po / C Ratio, was 204.6. See FAT1 Tonography Results Screen. In the FAT1 Tonography Clinical Study, Glaucomatous eyes had an Outflow Value less than 0.18 microliters / minute. A Po / C ratio greater than 100 is characteristic of glaucomatous eyes (Chandler and Grants Glaucoma, Fourth Edition, Chapter 6, Tonometry and Tonography, page 45 - 48). Visual field testing was performed. The decreased outflow facility, which did not respond to medical or laser surgery, was the cause of the elevated IOP. The patient underwent a trabeculectomy to bypass the dysfunctional trabecular meshwork. The Tonography function of the FAT1 device was used to assess aqueous humor outflow after the trabeculectomy procedure. Outflow was increased to 0.745 microliters / minute, confirming the effectiveness of the trabeculectomy. See the post-trabeculectomy procedure FAT1 Tonography Results Screen. A 67 year old male presented with an intumescent count fingers cataract in the right eye. Pupillary block was present. On direct gonioscopic examination the anterior chamber angle was closed at Grade 1. In the left eye and the anterior chamber angle was open at Grade 4. The Tonography function of the FAT1 device was used to assess aqueous humor outflow through the trabecular meshwork. It was reduced to 0.044 microliters / minute and the Po / C ratio was increased at 327.3. See the FAT1 Tonography Results Screen for the Right Eye. In the left eye, the aqueous humor outflow was 0.203 microliters / minute and the Po / C ratio was 88.7. See the FAT1 Tonography Results Screen for the left eye. One percent Pilocarpine was placed in the right eye and a YAG Laser Peripheral Iridectomy was performed. The pupillary block decreased and the anterior chamber angle deepened to Grade 3. Aqueous humor outflow was assessed post-iridectomy using the Tonography Function of the FAT1 Device. It increased to 0.374 microliters / minute, confirming the effectiveness of the iridectomy. See the post-iridectomy FAT1 Tonography Results Screen. The Goldmann Applanation Tonometer is based upon a proven physical principle, the Imbert-Fick Law. Use of this law to measure intraocular pressure has major drawbacks, which were identified by Professor Goldmann in his original publication: “On Applanation Tonometery by H. Goldmann and T. Schmidt, published in Ophthalmologica 134, 221-242, 1957”. The original publication was translated from German into English with the assistance of Pamila Seiving, Former Head Librarian, University of Michigan Kellogg Eye Center, and Holger Hansen, M.D., Dr. P.H., Professor of Community Medicine, University of Connecticut School of Medicine. What follows are excerpts taken from the original text, which identify the issues and limitations associated with Applanation Tonometry. It is important to recognize that non-contact tonometers are not based on the Imbert-Fick Law and therefore are not applanation tonometers. The question to ask is what physical law do they use to estimate eye pressure? No known proven physical law validating the methodogy of non-contact tonometers can be found in the published literature. They also do not have the ability to compensate for any of the measurement errors that Dr. Goldmann so aptly described. “Imbert-Fick’s Law States that the pressure of a fluid sphere, that is surrounded by a thin membrane can be measured by a counter pressure, which flattens the membrane. His necessary condition is that the membrane is extremely thin and without stiffness and that no other factors are involved”, page 221. “The 0.5 mm thick cornea represents by no means an extremely thin membrane without stiffness… The surface of the cornea is moistened by fluid. Consequently, capillary forces will operate when the cornea is flattened, depending on the moistening fluid and the adhesive properties of the flattening device and the cornea”, page 222. “Thus, a number of new problems arise which the abstraction of Imbert-Fick’s law does not take into account”, page 222. “Elasticity has the (dimension) characteristics of pressure and, therefore acts as additional pressure”, page 223. “We have assumed thus far that K1 (rigidity factor) is an expression of completely elastic forces. But because the cornea represents a rheological system, it should be presumed that it “floats” under the influence of deforming forces, i.e., after prolonged impact of those forces the cornea gains a new balance … One can see that in this experiment (Table VII and Figure 9), the tonometrically measured pressure declines in spite of manometrically constant pressure… This is an expression of floating of the cornea”, page 232. “Under circumstances that vary much from our measurement conditions (abnormally thin or thick cornea, e.g. keratoconus, animal eyes, epithelial edema) errors of several millimeters are to be expected”, page 241. As stated by Dr. Goldmann, The Goldmann tonometer cannot measure and therefore cannot compensate for the forces due to corneal wetness, thickness and elasticity. These forces affect the accuracy of all tonometers including non-contact tonometers. Issue: Current tonometer technology cannot measure the forces due to corneal wetness, thickness and elasticity. Therefore, the current technology cannot compensate for these forces, which limits the accuracy of the measurement. Solution: The FMAT1 optical and force generation system measures the forces due to corneal wetness, thickness and elasticity. The device compensates for these forces, eliminating the measurement errors associated with use of the Imbert-Fick Law. “One recognizes the coincidence of the two half rings (Fig 13) but some general technical expertise is necessary because eye pressure varies with the pulsating blood pressure. With correct measuring position, one can see the two half rings moving across from each other, with the inner margins of the half rings moving equally far to the left and the right” , page 240. “Thus even more since the quickly established eye pressure does not reflect the natural average eye pressure at the time of measurement. The natural average eye pressure at a given point could be recognized only if one could control constant changes due to not only the pulse wave and breathing but also the impact of the outer eye muscles, the changing tension of the lids and emotional influences” , page 241. Issue: The Goldmann tonometer does not measure the variation in intraocular pressure (IOP) that occurs with the cardiac cycle. IOP is higher in systole than diastole. The pulsating mires of the Goldmann Tonometer are evidence of this. When the inner edges of the mires are aligned, that is the diastolic phase of the cardiac cycle. This can be confirmed by checking the radial pulse when the inner edge of the mires are aligned, which is the end point according to the instruction manual. The mires separate during systole and cannot be aligned. The Goldmann tonometer cannot and does not measure IOP during systole. The average individual spends one-third of the time in systole and two-thirds in diastole. Because the Goldmann tonometer cannot measure the systolic IOP, the measurement is not a true average IOP. One third of the IOP data is not being measured. Other tonometers are not measuring the true average IOP as well. They lack the ability to determine at what point in the cardiac cycle data is being captured. The data capture is random. So a true average IOP is not being measured. The true average IOP is the combination of the IOP during systole and diastole. When blood pressure is measured both the systolic (SBP) and diastolic (DBP) is recorded. From those two values, the mean arterial pressure (MAP) is calculated, ((2DBP + SBP) / 3) = MAP. Solution: The FMAT1 optical system is able to determine what phase of the cardiac cycle the measurement is captured. The device measures the IOP during systole and diastole for several cardiac cycles and calculates a true average IOP. 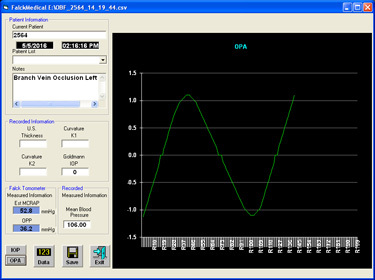 The Ocular Pulse Amplitude (OPA) is the variation in IOP with the cardiac cycle. The FMAT1 device measures and displays the true average IOP and the OPA. Repeatability in a measurement system refers to the ability of an operator to consistently repeat a measurement with minimal variation. Precision is how close the measurements are to each other. The closer repeat measurements are to each other, the less the variation. Accuracy is how close a measured value is to the actual true value. So the only way you can obtain an accurate measurement is to take multiple repeat measurements, calculate the average or mean value and calculate the variation. An accurate measurement should have minimal variation. The Goldmann tonometer only takes one measurement, and it is subjective because the user has to line up the scale. So the measurement is affected by the experience of the user and the subjective alignment of the measurement scale, which causes measurement bias. With only one measurement, it is not possible to determine the accuracy of the measurement. Other tonometers also have the same issue. Multiple measurements must be taken over time, averaged and the variation examined to determine if the measurement is accurate. Because decisions are made based upon the measured value, it is critically important that the measurement be repeatable, precise and accurate. Issue: It is not possible to determine the accuracy of a measurement with current tonometer technology. With only one measurement value, the repeatability, precision and accuracy of the measured value cannot be determined. Solution: The FMAT1 device samples every millisecond for multiple cardiac cycles. The sample data is analyzed for repeatability, precision and accuracy. The mean and percent variation is displayed to the user for his/her assessment. Laboratory studies have confirmed infectious prions in the tears of individuals with Creutzfeldt – Jakob Disease (Mad Cow), HBV virus in the tears of Hepatitis – B infected individuals, HCV virus in the tears of Hepatitis – C infected individuals and HTLV virus in the tears of individuals infected with the AIDS virus, (Br J Med Res 2014 Apr 30;4(12):2322-2333, J Infect Dis 2012 Aug 15;206(4):478-485, J Clin Microbiol 1995 Aug 33(8): 2202-2203, Ophthalmology 1986 Dec 93;12:1479-1481). For these potentially lethal diseases, the infectious agent is present in the tears before the infected individual manifests the disease. At this time, Hepatitis-C is the leading cause of death among all infectious diseases in the US, as reported by Kathleen N. Ly, MPH, CDC Division of Viral Hepatitis, (Clinical Advisor, June 2016, Page 14). Laboratory studies examining the disinfection efficacy of different regimens for tonometers have found that none are 100 % effective at removal of the Hepatitis-B Virus, Hepatitis-C Virus and the AIDS Virus. Studies also confirm that the infectious prions of Creutzfeldt-Jacob Disease (Mad Cow) are resistant to all conventional forms of sterilization, (Am J Ophthalmology 2001 Feb;131(2):184-187, Br J Med Res 2014 Apr 30;4(12):2322-2333, Arch Ophthalmol 1994 Nov;112(11):1406-1407, Arch Ophthalmol 1989 Jul;107(7):983-985). Studies done in the United States on individuals with Creutzfeld-Jakob Disease (Mad Cow) have confirmed that tonometry is a risk factor for infection: Ocular Tonometry and Sporadic Creutzfeldt-Jakob Disease: A Confirmatory Case-Control Study, Br J Med Res 2014 Apr 30;4(12):2322-2333. The study conclusion was that due to lack of effective disinfection regimens and confirmation that tonometry is a risk factor for infection, disposables are required. Issue: Lethal infectious agents of Hepatitis B, Hepatitis C, AIDS and Creutzfeld-Jakob (Mad Cow) Disease are present in tears. Disinfection regimens, even if they are followed, do not eliminate these pathogens. Additionally, contact tonometers can be used without confirmation of disinfection. They can also be used with or without disposable covers. There is no absolute requirement that they must be disinfected before use, or that a disposable cover is used, or that the disposable cover has been changed after it has been used. There is also no means of preventing reuse of a disposable cover or disposable probe. The micro-aerosols are dispersed in a cloud which are inhaled, deposited on external surfaces and deposited on the external surface of the eye. This creates the potential transmission of infection to not only other patients from contaminated surfaces but directly to staff from inhalation of the infectious micro-aerosols or deposition on the ocular surface. Solution: The FMAT1 device uses a disposable plastic prism. The prism must be changed before a measurement can be performed on a different patient. The device has a detection system that is able to determine if the prism has been used. It is an absolute barrier to the transmission of infectious disease. to Calibrated Weight Indentation Tonography. Agency for Healthcare Research and Quality. Department of Health and Human Services. Comparative Effectiveness of Screening for Glaucoma. 01/04/2011. Clinical Comparison of the Falck Applanation Tonometer (FAT Model 2) to Goldmann Applanation Tonometer. Agency for Healthcare Research and Quality. Department of Health and Human Services. Comparative Effectiveness of Treatment of Glaucoma. 01/04/2011. Macular Society Meeting, 02/2010. Anti-VEGF Injections Decrease Ocular Perfusion Pressure. Association in Research in Vision and Ophthalmology Meeting, 05/2010. Anti-VEGF Injections and Ocular Perfusion Pressure. World Forum 2010, Cambridge University, 08/2010. Strategies for Preventing Blindness. World Glaucoma Congress, Paris, France , 07/2011. Anti-VEGF Injections Independently Increase Intraocular Pressure and Decrease Ocular Perfusion Pressure. Association for Research in Vision and Ophthalmology, 05/2000. 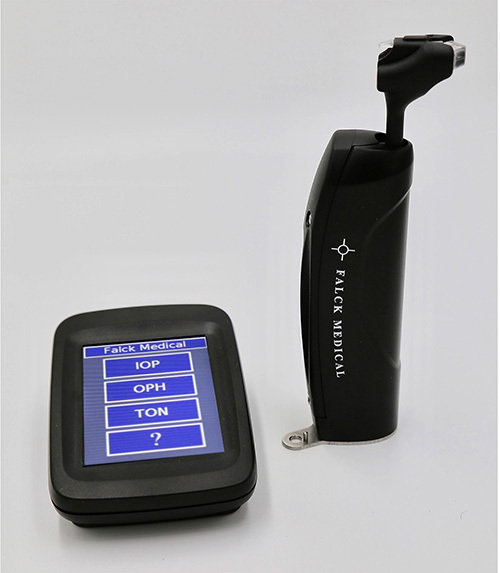 Falck Medical Applanation Tonometer Intraocular Pressure Measurements, Corneal Thickness and Corneal Curvature. 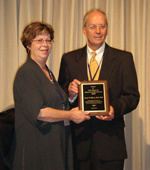 Dr. Francis Falck, Chief Executive Officer, Falck Medical, Inc received the “2010 Man of the Year in Medicine and Healthcare Award” at the World Forum 2010, Cambridge University, Cambridge, England on August 18th, 2010. Dr. Falck was recognized for his milestone work developing diagnostic technology that will be used worldwide to prevent blindness and stroke. The World Forum 2010 was attended by 150 scholars from 40 different countries. As a user of the website, falckmedical.com, you agree to the following terms and conditions. These terms and conditions are legally binding between you, the user, and Falck Medical, Inc. If you cannot agree to the terms and conditions do not use the web site. The material provided is for informational purposes only. It is not to be used as a recommendation for diagnosis or treatment. No employee, agent or representative of Falck Medical, Inc. is a part of the doctor-patient relationship. Falck Medical, Inc. makes no warranty, express or implied, regarding the fitness or merchantability of any of the products for any application. You agree to use the products and information provided at your own risk and also agree to indemnify and hold harmless Falck Medical, Inc. and its respective directors, officers, employees, licensees, agents, successors and assigns, from and against any and all claims, damages, costs, judgments, penalties, expenses of any kind. This information and content is copyright protected and is not to be reproduced without the express written permission of Falck Medical, Inc.
© 2016 Falck Medical, Inc. All rights reserved.